We were to discuss food preservation with our students because Ma and the girls were drying plums. In other words, they were making prunes. I learned the California Plum Board made a bold name change because they felt prune had a negative image. Ya’ think? Anybody else out there suddenly thinking about irregularity? The FDA approved their name change, so we need to get with the times. Or rather, get back to the pioneer roots when they were dried plums and not prunes. When you read the above link about plums, you discover they had great nutritional value. I wonder if Ma knew this, or if they were busy just trying to make sure they had food for the winter. Anyhoo, instead of just waxing eloquent about food preservation, I remembered something. Years ago, when I didn’t live in the Apple State of Washington and everybody had apple trees in their yards because we weren’t worried about apple maggots and we rarely paid over $1 per pound for apples, I used to make a lot of dried apples and applesauce. It was a yearly fall tradition. Then we moved to the apple state and could no longer afford to cut up apples that cost at least $1 each just to shrivel up in my dehydrator and eat in a few bites. 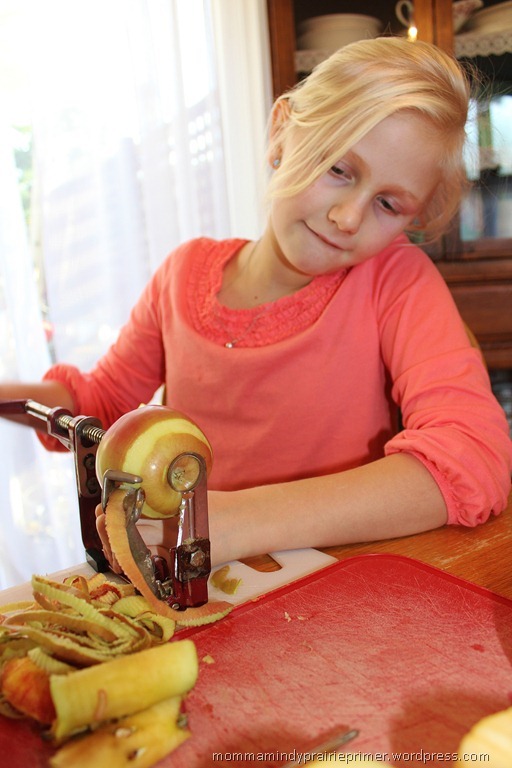 But, we had a few on sale for $1.67 apples that were getting a little mushy, and Beka had never participated in the fall tradition, so we pulled out my tools. 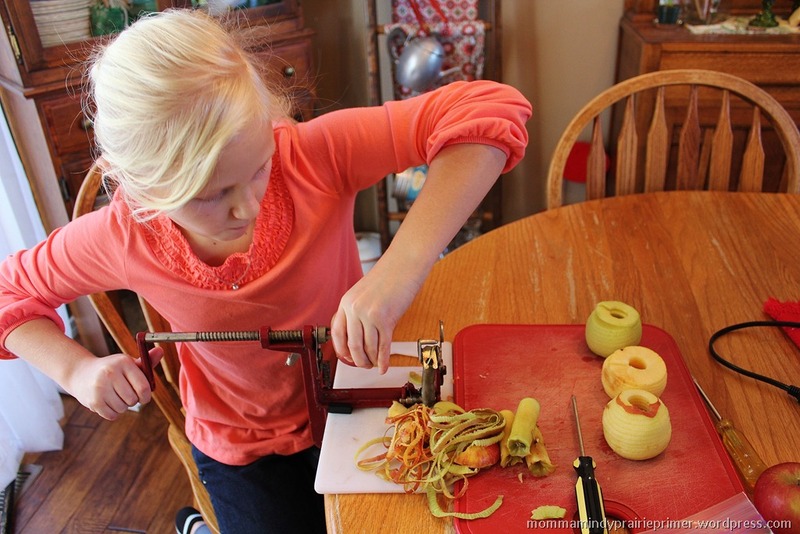 An apple peeler/corer is amazing. Of course, it took me awhile to remember how to use it, and I had to tighten the screws before I could get back into that Becky-Home-ecky groove. Kids tend to be more helpful when cool and/or dangerous tools are involved. I remembered to not tell Beka this was “school” so she would think it was still fun. Oh, the mind games we sometimes have to play! I’ve also been known to use the Tom Sawyer trick, where I really “enjoy” a work project until they ask to help. Moms can be so devious smart sometimes! 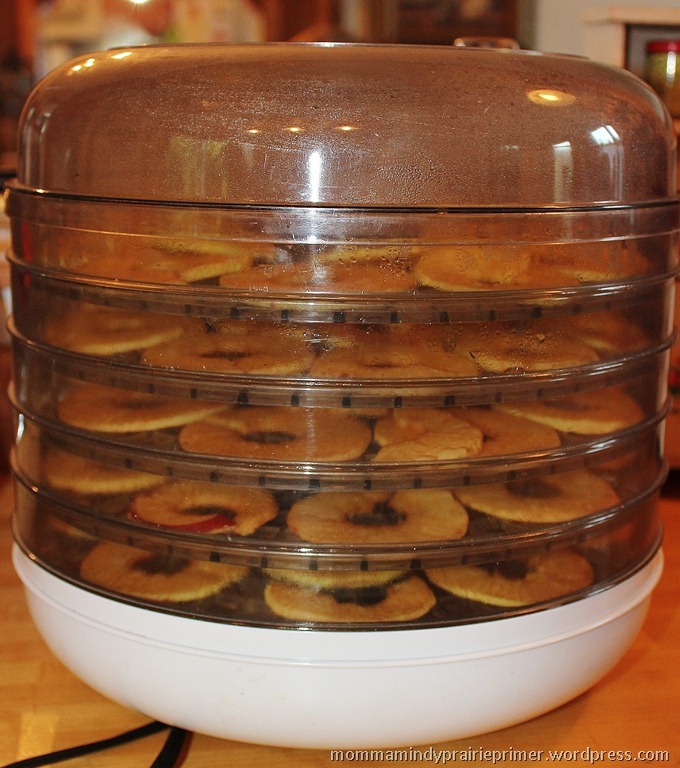 I’ve owned this dehydrator for over two decades, and was a super cheapy one to begin with. My hubby was a teacher at a private Christian school, so were were living on love and faith. I used coupons and rebates to buy most personal things for the home. I had been saving my rebate money for awhile when this went on sale for around $20 at the Pamida store in Valley Center, KS. I’ll never forget the feeling of walking out of the store with this in my arms. I felt rich. 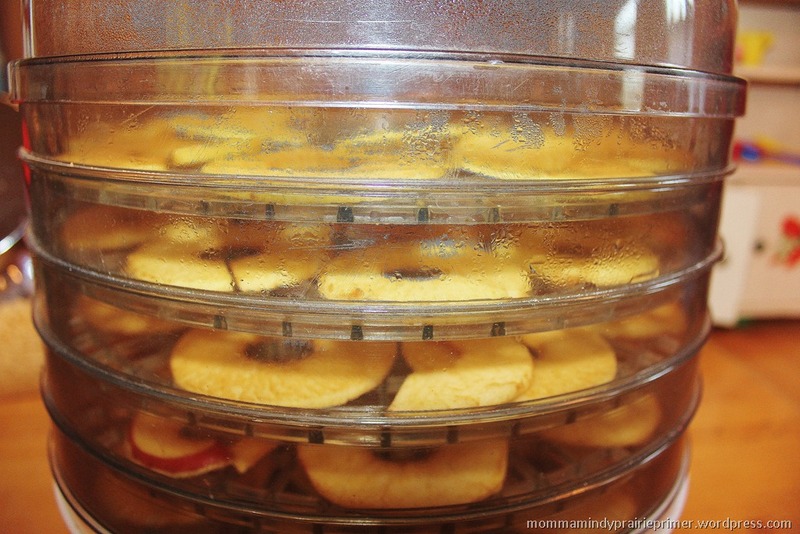 I owned a dehydrator. You know why the Lord answers prayer and provides for His people? It evokes praise! Years later, I look at this cheapy little dehydrator, and I am STILL thankful to the Lord for His provision. For many years, we dehydrated apples and pineapples (cans of rings, well drained) for gifts for other people, so we were able to pass on the blessing. That’s another reason the Lord blesses us, so we will pass on blessing to others. Drying in my little guy took only about 24 hours, and we quickly ate them all and had to make another batch. To keep your apples from turning brown, dip them in lemon juice or pineapple juice. I prefer pineapple juice because of the sweetness. In The Little House Cookbook by Barbara M. Walker, she gives instructions for drying apples without a dehydrator. You simple slice apples in 1/8 inch disks and slip them onto string or rods. Hang them in a warm, dry place like a furnace room or sun porch. She said you can even use curtain rods over a sunny window or a laundry rack near a radiator. (p. 129) In other words, you use that pioneer spirit to figure out what works best for your living situation. She said to use fresh, tart apples and to peel them only if the skins are tough. Hard times calls for different rules. I always thought it was a great way to not waste apples that were getting mushy because you were going to make them mushy, anyway. 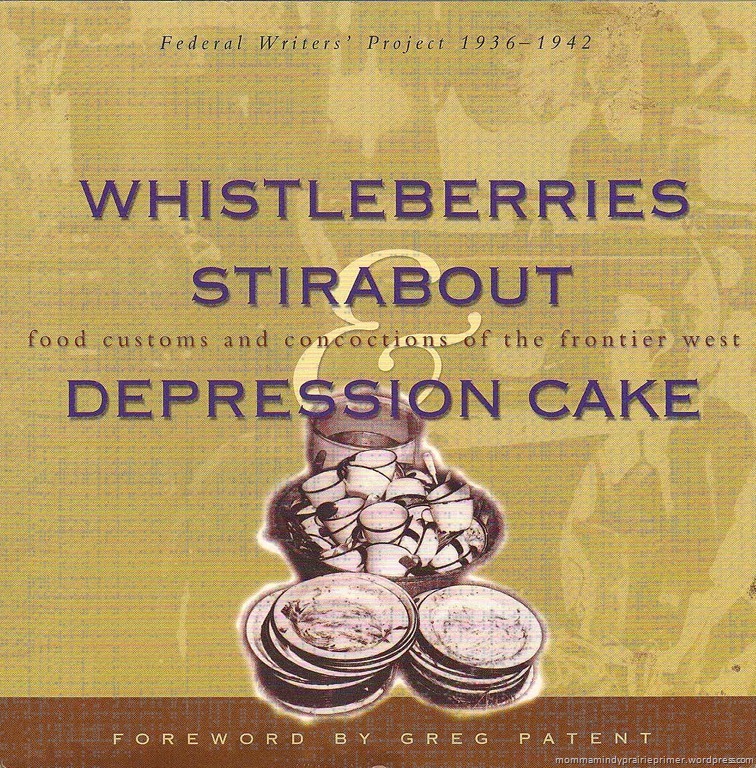 This recipe was on p. 83 and was considered a specialty from Utah. I read this and realized why pioneer women were always so tired. First, this batch is HUGE. I think she was cooking for a threshing crew. Next, it would take almost all day. Set one good book and a handful of prunes on the couch. Leave the eggs for breakfast in case you read too late into the night. Save the sugar for cookies, they taste better. Sprinkle cinnamon, allspice and cloves on the counter so the house smells good and people who walk in think you’re productive. 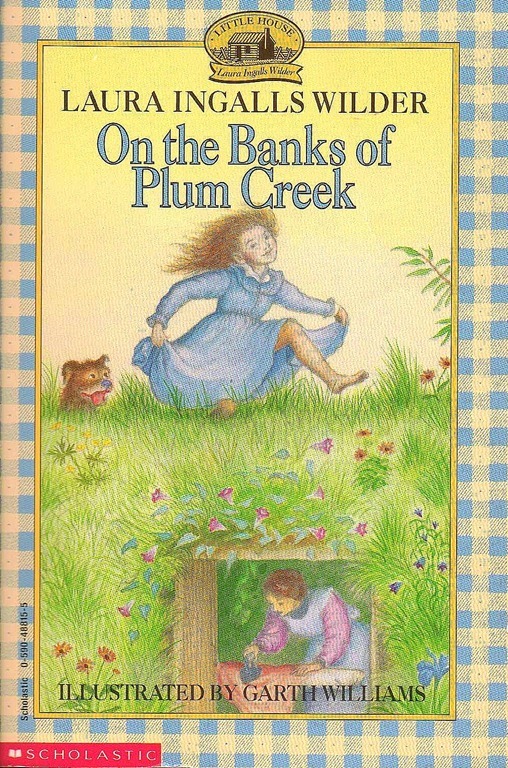 Go back to the couch and read the whole book, while nibbling on a few prunes. I have great childhood memories of picking chokecherries, asparagus, currents and rosehips in Montana, then watching my mom busy in the kitchen. There was such a satisfaction in lining the shelves with brightly hued jellies and syrups. Sometimes I feel bad asking my kids to do chores, this generation is much more kid-centric. Some of my kids’ friends don’t have any chores. Instead of spending our days in tasks for survival, the average modern parents spend their days fulfilling their children with play-dates, various lessons and sports. These things are good in moderation, but as I read through Little House books, I am once again reminded of the most valuable thing my parents passed onto me. It wasn’t valuable family heirlooms. It was a great work ethic, along with the knowledge and experience to accomplish anything and everything I needed to do as a wife a mother. I would be a fool to not pass on this most valuable heritage to my own children. That’s why some days, we cast aside the books and the worksheets, pull out the tools and work together. I am determined to pass on the most valuable heritage, just like my Mom and Ma Ingalls did.